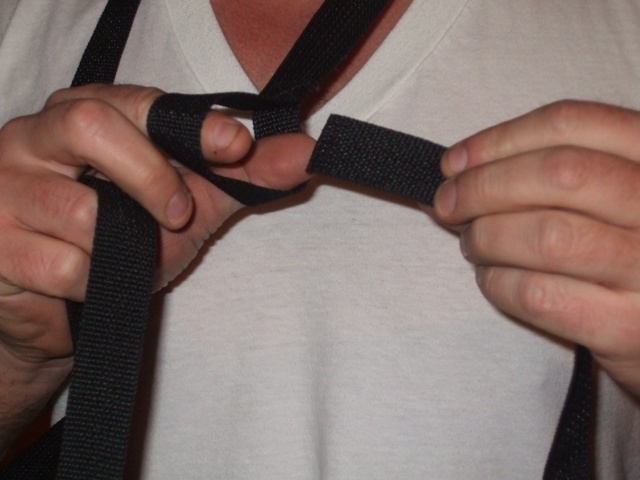 This idea for a homemade isolation strap, the article and images came from Jack Brady, a reader of this web site. I designed this ab coaster isolation strap primarily for the Ab Coaster and for doing weighted hyperextensions. The problem I had and I'm sure other people have experienced is that the Ab Coaster fatigues the whole upper body, especially if you workout the upper body intensely before working out your abs. My shoulders, lats and arms would burn just as much or even more than my abs. 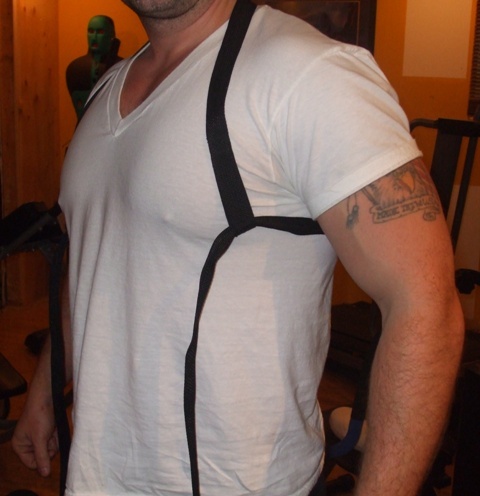 I created this strap to give those muscles a break. I was amazed by the results. 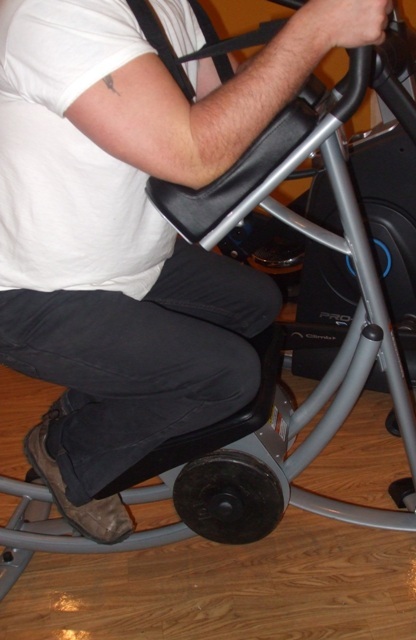 If set up properly, it completely relieves those muscles giving total focus on the abs. Prior to the strap I was able to do 250 reps without extra weight plates. About a week into using the strap I was able to do 2000 reps without any pause. This took awhile, approximately 45 minutes, so I started stacking on the weights. The home version of the Ab Coaster only recommends adding 20 pounds of weight plates, but I figured it could at least handle an extra 40 pounds. 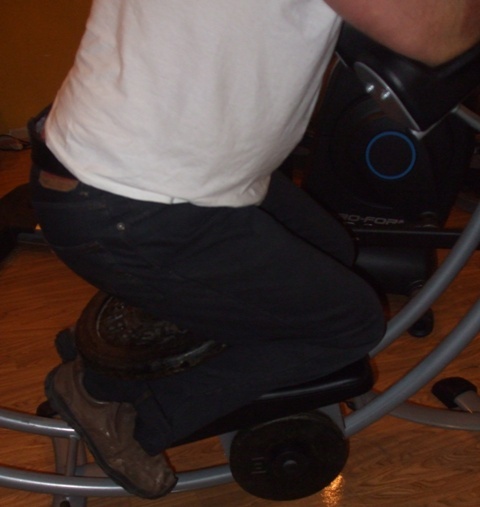 I could only add four ten pound plates because bigger diameter plates interfered with the swivel movement of the seat. The strength of the abs increases quickly, so I kept adding weight for more and more resistance. I now rest a fifty pound plate on my calves in addition to the 40 pounds and still pump out 500 reps.
One of my New Year's Resolutions was to develop my abs. Prior to New Years my waist was a 36, now in early March it's a 32 with a six pack starting to show. 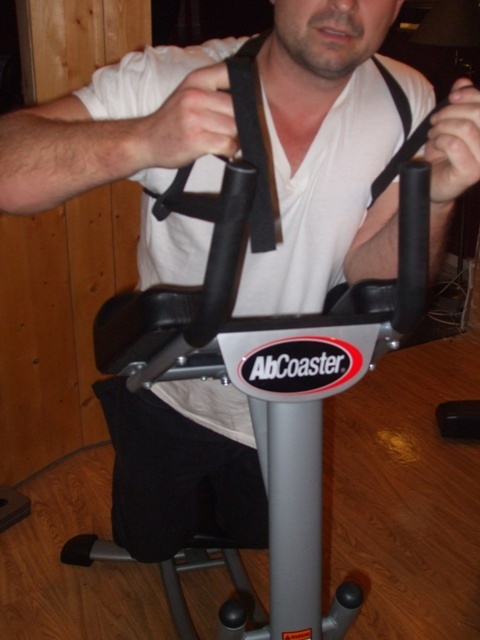 I was about to give up on the ab coaster at the end of last year because it seemed too hard on the overall upper body, plus I had shoulder surgery that didn't turn out as I hoped, and that was causing additional unnecessary pain while working out on the ab coaster. 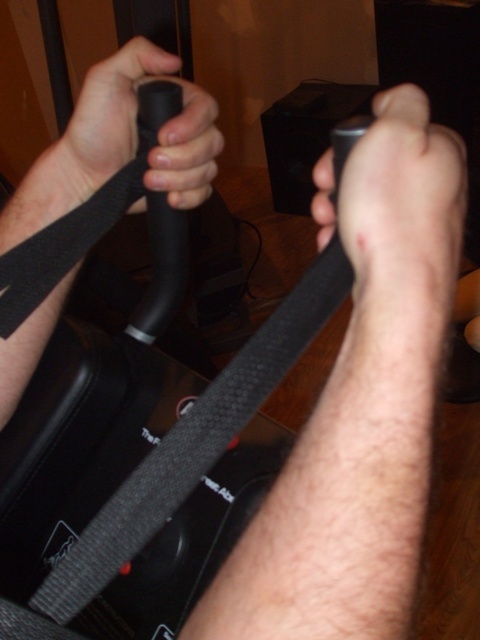 Using this strap makes it fun to conquer the ab coaster and get great results. I also use the strap when doing weighted hyperextensions. I wrap the ends around a dumbbell, keeping the dumbbell tight to my upper body, relieving the upper body muscles allowing the focus to be on my lower back. I hope you and your readers with an Ab Coaster or people who plan to get one can benefit from this idea. 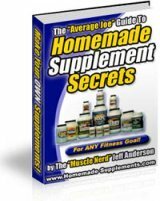 I'll send you pics of my home gym and self-modified equipment. Thanks for building a cool web site. 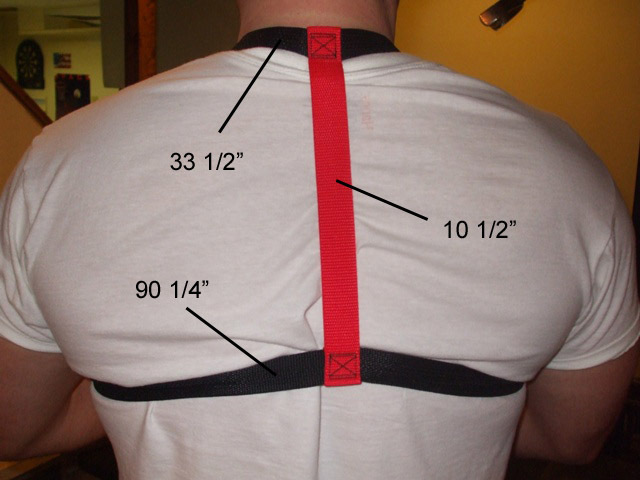 The measurements indicated in the photo are from end to end of the strap loops. To begin, cut the straps to the following lengths: Top black strap: 41 1/2"; red strap 13"; bottom strap 91 1/4" (no loops). The red strap is folded over both black straps, then sewn. The strap is really easy to make, you just need to know someone with a sewing machine (wife, girlfriend, mother, aunt, etc). You can get the strapping at any fabric store. 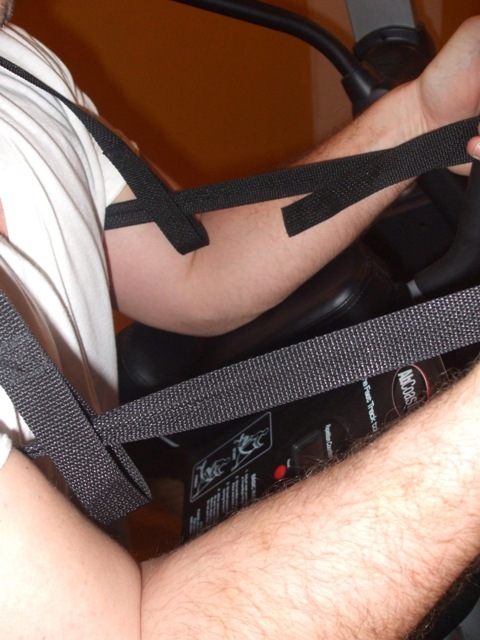 This strap effectively supports the upper body by locking it into place on the ab coaster. It really does work. You need to make sure the strap is resting on your back under your shoulder blades. This position gives you the best support. 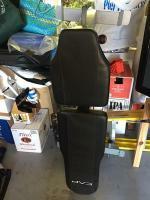 When Jack told me he uses the strap and puts a weight plate on his calves, I thought that it would be really hard to get everything into position while kneeling on a seat that moves. But, it was surprisingly easy! By adding a weight plate on my calves, and using the Ab Isolation Strap for more upper body support, I can now really work my abs by doing high reps with extra weight without fighting to keep my upper body in position. 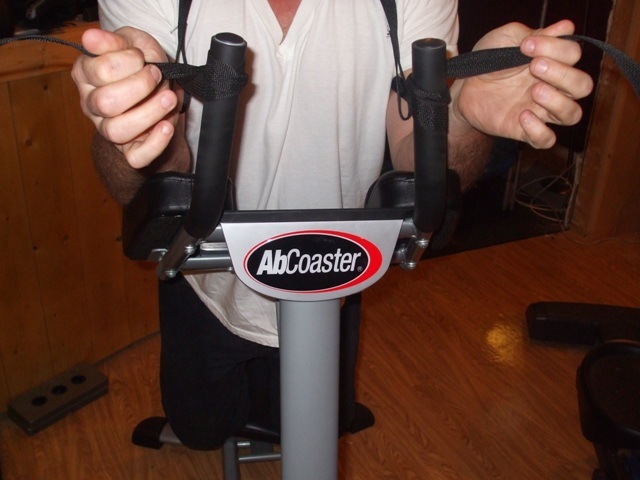 My Ab Coaster now is just as effective as a Hammar Strength Ab machine at a commercial gym. I have the light commercial version of the Ab Coaster, so the weight capacity of this machine is 400 pounds. I can add at least five-45 lb plates resting on my calves! This will be very hard to do, not to mention uncomfortable and not to safe. Right now I have 30 pounds on the posts built into the seat, and I rest a 45 pound plate on my calves. I know I can do more weight. Here's an easy way to add more weight to the seat.